From the Chronicle of Higher Education: Meet the Math Professor Who’s Fighting Gerrymandering With Geometry, an interview with Dr. Moon Duchin, an associate professor of math and director of the Science, Technology and Society program at Tufts. Q. What is the Metric Geometry and Gerrymandering Group’s aim? A. In redistricting, one of the principles that’s taken seriously by courts is that districts should be compact. The U.S. Constitution does not say that, but many state constitutions do, and it’s taken as a kind of general principle of how districts ought to look. But nobody knows exactly what compactness means. People just have the idea that it means the shape shouldn’t be too weird, shouldn’t be too eccentric; it should be a kind of reasonable shape. Lots of people have taken a swing at that over the years. Which definition you choose actually has stakes. It changes what maps are acceptable and what maps aren’t. If you look at the Supreme Court history, what you’ll see is that a lot of times, especially in the ’90s, the court would say, Look, some shapes are obviously too bizarre but we don’t know how to describe the cutoff. How bizarre is too bizarre? We don’t know; that sounds hard. Q. It’s like how they define obscenity. A. Exactly. When I started thinking about this, I was surprised to see that even though there were different mathematical attempts at a definition, you don’t ever see mathematicians testifying in court about it. So our first aim was to think like mathematicians about compactness and look at all the definitions that already exist, and compare them and try to prove theorems about the relationships between the definitions. What courts have been looking for is one definition of compactness that they can understand, that we can compute, and that they can use as a kind of go-to standard. I don’t have any illusions that we’re going to settle that debate forever, but I think we can make a contribution to the debate. Richard Feynman learned this from a friend when he was young, and it stuck with him his whole life. Origami, the art of paper folding, has been practiced in Japan and all over the world for centuries. The past decade, however, has witnessed a surge of interest in using origami for science. Applications in robotics, airbag design, deployment of space structures, and even medicine and bioengineering are appearing in the popular science press. Videos of origami robots folding themselves up and walking away or performing tasks have gone viral in recent years. But if the art of paper folding is so old, why has there been an increase in origami applications now? One answer is because of mathematics. 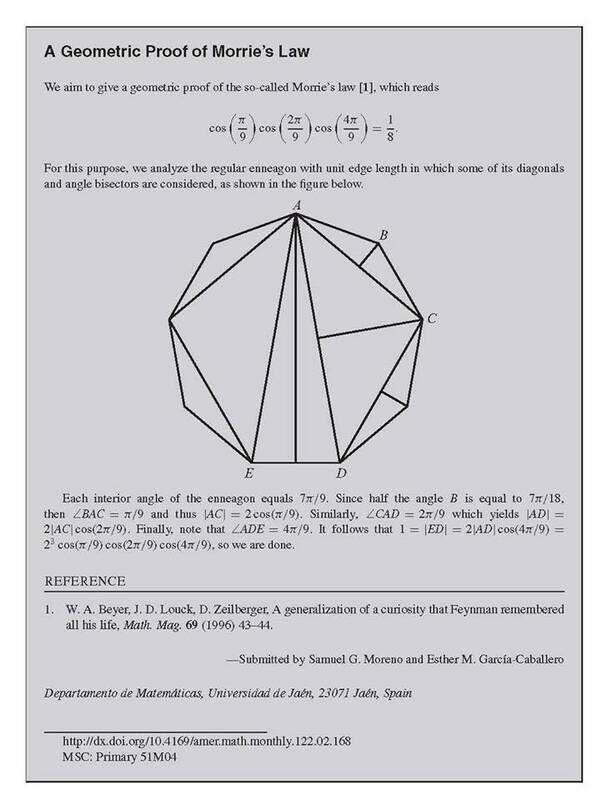 Advances in our understanding of how folding processes work has arisen due to success in modeling origami mathematically. In this presentation we will explore why origami lends itself to mathematical study and see some of the math that has allowed applications to become so fruitful. Suppose I write down two different numbers on two slips of paper. You have no idea what the two numbers are. They could be really large or really small, positive or negative, rational or irrational. All you know is that the two numbers are different.Your job is to pick the larger number. Is there a way for you to guess the larger number with a probability greater than 50%? Want to know one of my favorite assignments that I have ever given my students? Want to know learn a lot of useful information about your students in a short amount of time? As your instructor, I want to get to know you as a person and as a student of mathematics. This will help me better meet your needs. It also helps our department as we work to improve our services to students. Where are you from? How did you decide to attend Fort Lewis? What is your educational background? Did you just graduate from high school? Have you been out of school for a few years? If so, what have you been doing since then? General interests: favorite subjects in school, favorite activities or hobbies. What math classes have you taken and when? What have your experiences in math classes been like? In what ways have you used math outside of school? Do you learn best from reading, listening or doing? Do you prefer to work alone or in groups? What do you do when you get “stuck”? Do you ask for help? From whom? Describe some of your study habits. For example: Do you take notes? Are they helpful? Are you organized? Do you procrastinate? Do you read the text? What are your responsibilities as a student in this course? What do you expect from your instructor? What are your educational and life goals? How does this course fit into your educational goals? It was fantastic! Students took it way more seriously than I could have imagined. Some wrote pages and all wrote enough to get to know them. It made me realize that we don’t give our students opportunities to share their math baggage/backgrounds/etc. with us often enough. Students shared everything from horror stories about being shamed in math courses to their excitement about math. Some let you know what they have heard about your class and even fears they may have such as a fear of presenting or working with others. Dr. Sumanth Swaminathan of W. L. Gore & Associates talks about his career path and the research questions about filtration that he considers. He works to understand the different waste capture mechanisms of filtration devices and to mathematically optimize the microstructure to create better filters. The last tongue-in-check equation is my favorite. In this series, I’ll explain why these different expressions for have to be equal to each other. I’ll begin with tomorrow’s post.